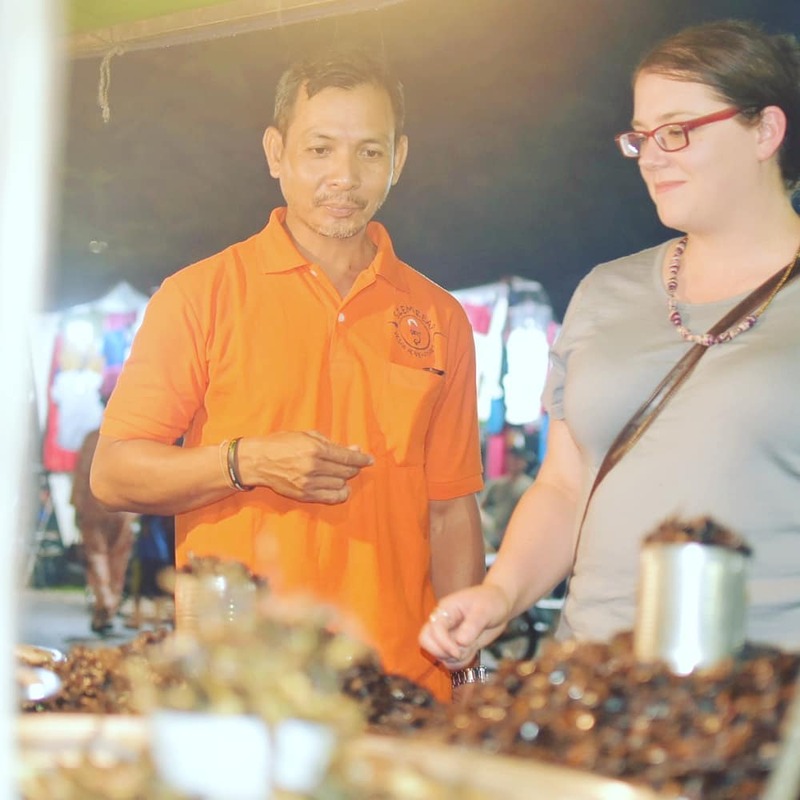 But, I was there for a food tour, and Cambodians eat a LOT of bugs, so this was my chance to to try out the crispy critters in an authentic environment. And so, at the urging of my guide, I grabbed one small cricket and popped it in my mouth. It was … not bad, actually! Crispy and fried are two of my favorite food descriptions, and they honestly didn’t disappoint even when the food item was something I’d normally shoo out of my house rather than serve to my guests. 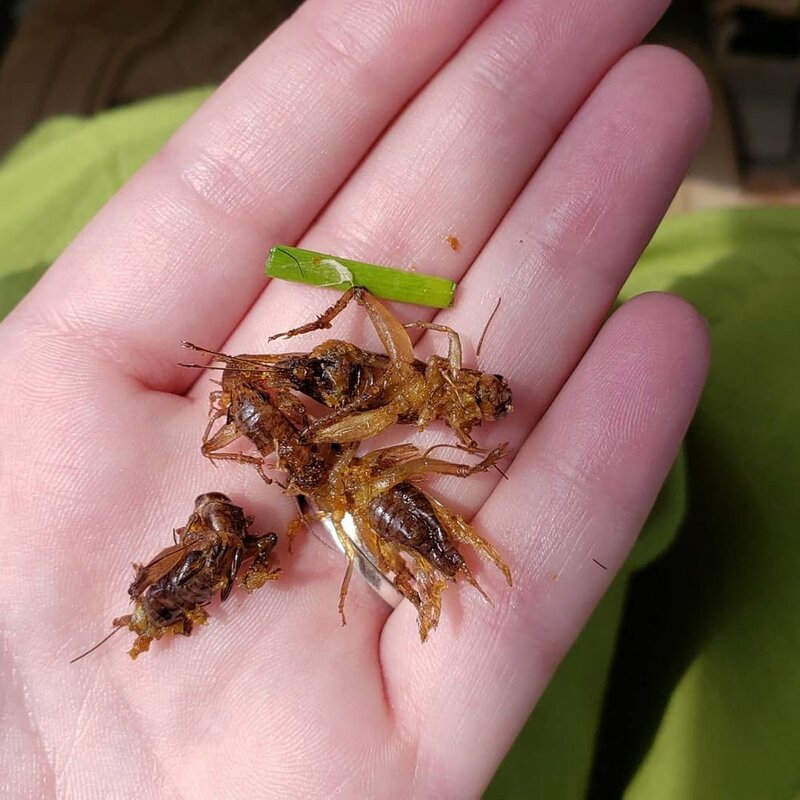 For me, and I think for many Americans, the problem is not so much the flavor (crispy, salty, garlicy) as it is getting past the mental block of actually eating some of these creepy crawlies. Even I, in my most adventurous mood, stuck with the smallest of the bugs on offer and hesitated any time something new was presented, even just for a second. 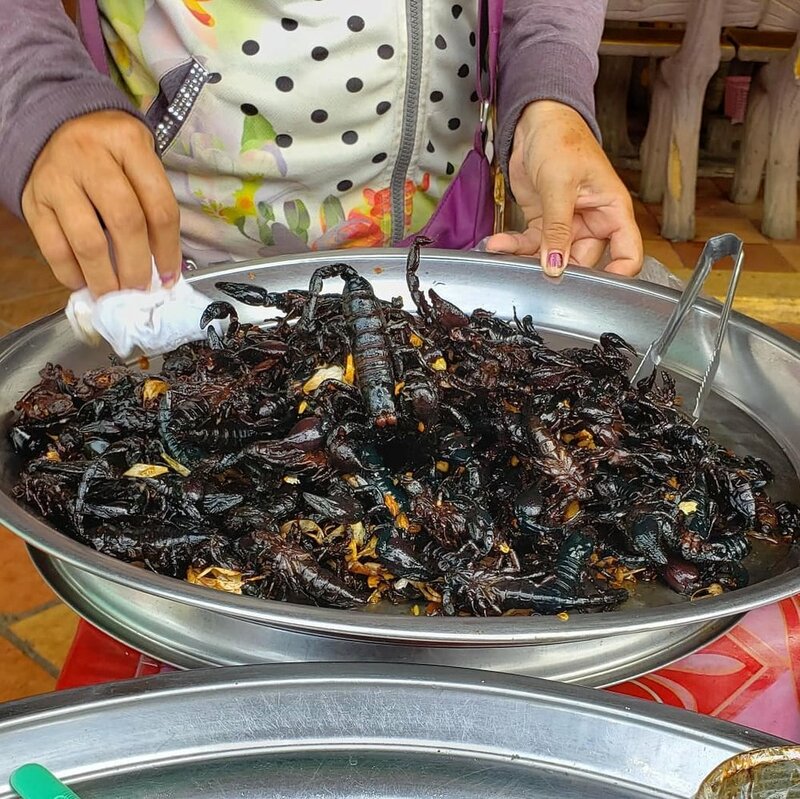 But for Cambodians, with not-so-distant memories of living off of whatever they could catch and eat during the rule of Pol Pot, insect eating is a way of life. Those giant water bugs on display look to me suspiciously like the creepy cockroaches that scare the daylights out of me when they surprise me in my house and get promptly squished, but look to many cultures around the world like a heaping helping of inexpensive protein. I don’t pretend to be a bug-eating aficionado because I tried a few crickets, grubs and ants while I was in Cambodia, but I DO wish that more Americans (myself included) could get past that socially ingrained mental block, even if just to experience a huge part of the culture of the country they’re visiting. That being said, my culturally ingrained blocks kept me from getting anywhere near the scorpions or tarantulas that were on display, as much as I wanted to be able to say later that I’d tried them! Maybe the images of Anthony Bourdain choking down tarantula in Cambodia were just too much for me to imagine that I might actually like it! What about you? Have you tried bugs, or would you try them if given the chance?